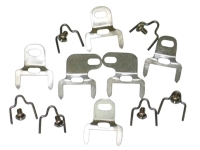 Weatherstrip clip sets include clips, wire retainers, and screws. Our clips were designed to add the correct look to the reproduction door weatherstrips. Yes, the original clips did have a "Fish Hook" barb, but that was to hook the clip to the reinforcement wire, which was molded into the original door weatherstrips. The reproduction door weatherstrip do not have this wire 1961-1962 .